Do you like to enjoy a cool, refreshing drink every now and then? I'll admit that I rarely drink, but once in a blue moon - I like to enjoy something delicious and refreshing! 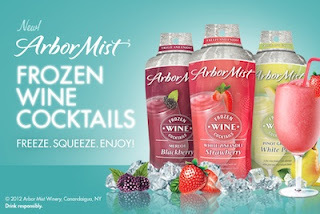 That's what I love about Arbor Mist Frozen Wine Cocktails... they are delicious and convenient! I don't feel at all like I'm drinking an alcoholic drink, it's more like a slush dessert. Top with a piece of fresh fruit on the side of the glass and it's the perfect way to end a long, hot summer day! Arbor Mist Frozen Wine Cocktails are a new way to enjoy great-tasting wine with a splash of fruit, frozen! Great for a backyard party, pool day, barbeque or casual get-together with friends and family – simply freeze, squeeze and enjoy. Arbor Mist Frozen Wine Cocktails require no mixing of ingredients, ice or blenders. Simply place the liquid pouch in the freezer for five hours, gently massage, tear open the top, squeeze to pour into a glass and enjoy a smooth frozen wine cocktail with all the great taste and same alcohol level as Arbor Mist wine. Even though I think it's a toss up, the Blackberry Merlot is my favorite... for now! But, I will say that all three flavors were simply divine! How would you enjoy an Arbor Mist Frozen Wine Cocktail? Disclaimer: I received complimentary Arbor Mist Frozen Wine Cocktails as a member of SheSpeaks for the purpose of writing a review. Regardless, I only recommend products or services I use personally and/or believe will be a good fit for my readers. The views and opinions expressed on this blog are purely my own. Results may vary. No monetary compensation was received.